... had to become multilingual to survive in the Nicaragua and Colombia of the 1980s, after arriving there knowing only English, German and French. She is a teacher and is active in continuing/in-service training for teachers with a focus on multilingualism (in particular in cooperation with the integration project okay-zusammenleben) and has taught a seminar on multilingual didactics in theory and practice at the University of Innsbruck for several semesters. 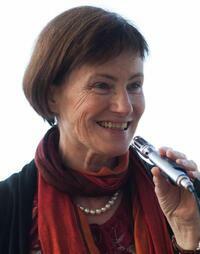 She has played an active role in the establishment and development of language competence centers (e.g. SpEAK at the PI Feldkirch, language center of the VHS Götzis), and has also been involved in several Comenius and Erasmus projects. Current focus: education and in-service teacher training, development of plurilingual curricula (Project PlurCur at the European Centre for Modern Languages – Graz; Plur>E as an Erasmus+ project), multilingual didactics. Dissertation (in progress): Multilingual training at school: Does it enhance language proficiency and metalinguistic awareness in multilingual learners?